Old secrets come to light with the usual unpleasant results. Journalist Rona Parish’s father, on the brink of divorce from Rona’s mother, thinks the Curzon family’s pottery works would make a nice addition to her series on old family businesses. Mrs. Parish is refurbishing a spare room as a bed-sit when Rona bumps into Julia Teale, in town on business, and recruits her as a short-term guest for her mother. Meanwhile, the Curzons, with a groundbreaking new product coming out, agree to let Rona write the story and consider showing her the new line, a target of industrial espionage. But Rona’s less interested in business than in family history. Granted access to family papers, she unearths a letter revealing an old scandal. George, the founder’s son known as the “Rogue in Porcelain,” fathered the child of a mill worker who was paid off. When attractive divorcee Finlay Curzon, Rona’s contact with the Curzon family, shows her the family plot, they discover the body of Julia, who turns out to be the ex-wife of Finlay’s cousin Nick. Is Julia’s murder a result of her divorce, the old scandal or industrial espionage? Rona’s research turns up enough to put her in real danger. Stamped from the same mold as the last entry in the Marsborough series (A Family Concern, 2006, etc.). 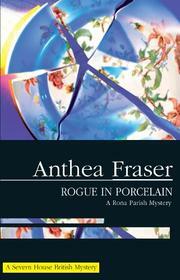 The mystery’s not up to snuff, but fans will doubtless enjoy the ongoing Parish family saga.